In class we will begin making the Carousel quilt. 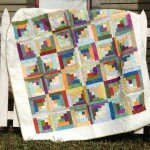 Students will learn the technique of using a creative grid ruler to make a curvy log cabin quilt block and how to arrange your blocks to create the design in the carousel quilt. Requirements: Each student will need a sewing machine in good working order. Thread in a neutral color. The creative grid 8" Curvy Log Cabin Trim Tool (available at the shop) 10 Fat Quarters in different colors in medium or dark value & 10 Fat Quarters in very light value. 1 #/4 yard very light value for border. You will also need binding and backing fabric as well as batting depending on quilt size.